Over the past few years, I’ve come to the conclusion that the key to a perfect morning is a steamy cup of Matcha! This traditional Japanese elixir dates all the way back to the 13th century when it was introduced by Zen Buddhist monks in China. There’s a reason it is still so popular and trendy today. Matcha provides hundreds of health benefits. If you’re new to Matcha, trying to cut back on coffee or just looking for a new powerhouse drink to start your day with, I highly recommend my dairy-free, creamy Matcha Latte. 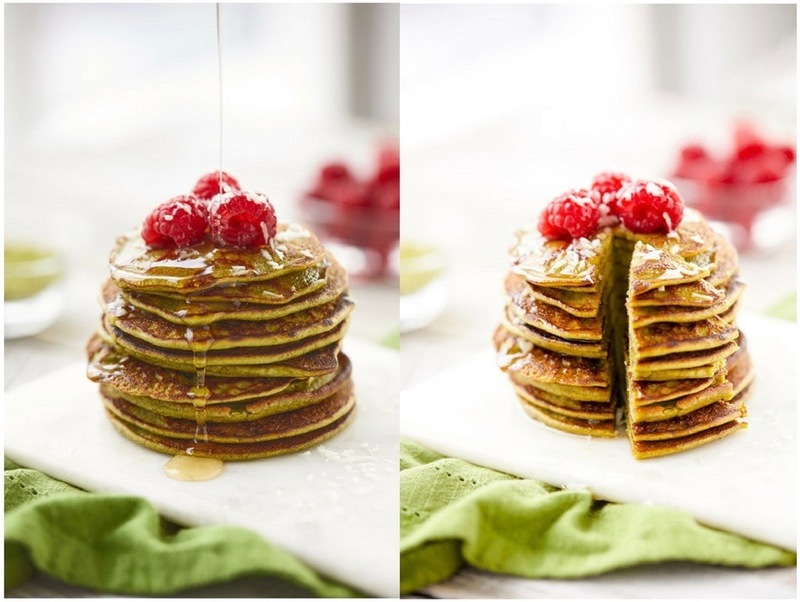 If you want to up your Matcha game even further, you can try my Matcha Pancakes. 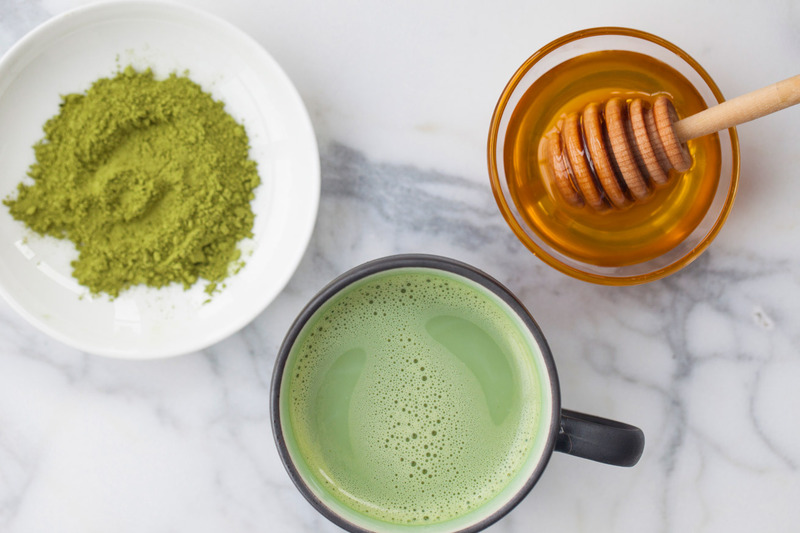 This tasty recipe is a foolproof and delicious way to introduce all your loved ones to Matcha. Seriously, pancakes and Matcha are a Matcha’ made in Heaven! Thought blueberries were the high in antioxidants? Matcha contains 1573 antioxidants units per gram, which is 20x more than that in blueberries! Antioxidants fight free radicals in your body which can protect you from chronic disease. Matcha is rich in Catechins (EGCg) a potent class of antioxidants which aren’t found in other foods. Catechins have cancer-fighting properties and can slow down your body’s aging process, which will keep your skin looking radiant and younger! Catechins can also have a huge effect on weight loss. A study showed that a group of men having Matcha daily lost significantly more body weight, reduced their BMI and waist circumference than a group having regular green tea. Matcha also boosts your body’s metabolism during exercise by boosting your body’s fat burning abilities by up to 17%! To get the most out of your spin class, fuel up with Matcha before class. There’s a reason Matcha was used by Japanese monks as an aid to meditate for several hours – it kept them alert yet calm. Matcha is rich in L-Theanine, an amino acid which promotes a sense of calm by countering the effects of beta waves caused by stress. A single cup of Matcha contains 5x more L-Theanine than regular green tea, making it the true superhero of all teas! Matcha is a great alternative to coffee, which can make you feel nervous and jittery. According to various studies, Matcha lowers LDL (‘bad cholesterol’) and increases HDL (‘good cholesterol’) levels in the blood. High levels of LDL are strongly correlated with preventable chronic diseases such as type 2 Diabetes, Obesity and Heart Disease. On the other hand, HDL cholesterol protects you against these. People who drink Matcha are 11% less likely to be at risk for heart disease than those who don’t. Matcha contains EGCg, which increases the production of T-cells in your body. T-cells help to reduce inflammation and fight pathogens. This makes Matcha a great way to protect yourself during flu season, especially during the winter months! Matcha also contains high levels of antibacterial flavonoids which can kill off germs from infections and are great for soothing sore throats. Matcha’s bright green color comes from chlorophyll – a pigment that has magnificent detoxifying properties. Chlorophyll can pull heavy metals, toxins and harmful chemicals from your body. A study also found that chlorophyll significantly reduced the levels of ingested aflatoxin – a known carcinogen – in the blood.